Deciding what to make was a bit of a challenge. I sort of flew by the seat of my pants, but I was pleasantly surprised by the results! Don't you love it when that happens? 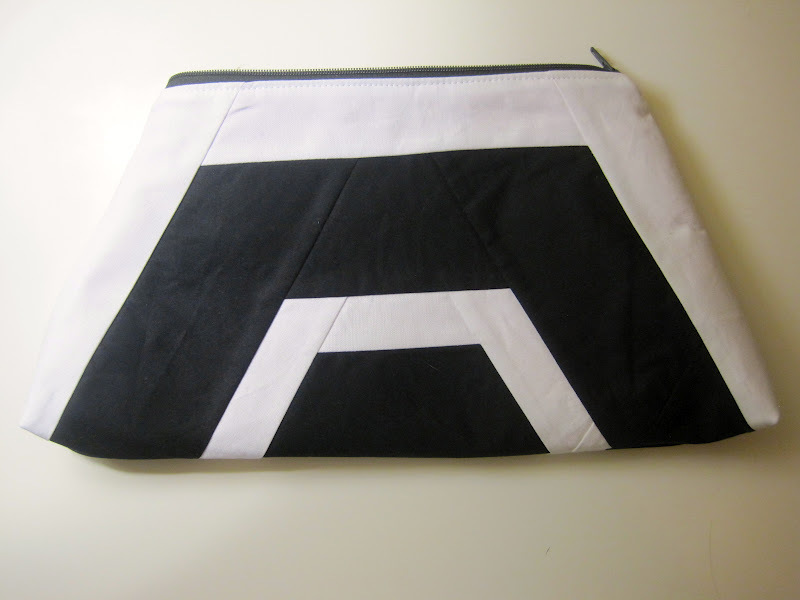 So I present you with the Boxy-Hexi Pouch! I did not take pictures of how I assembled hexagon, but I can talk you through it. Alternatively, you could cut one large hexagon with each side measuring 9.5". Cut a center hexagon--I used a hexagon ruler--that measures 5.5" high, each side is 3.25" long. Cut 2 WOF strips that are 3" wide. Repeat method linked above. Cut 2 WOF strips that are 2.5" wide. Repeat method linked above. You should now have a hexagon that measure approximately 9.5" on each side. 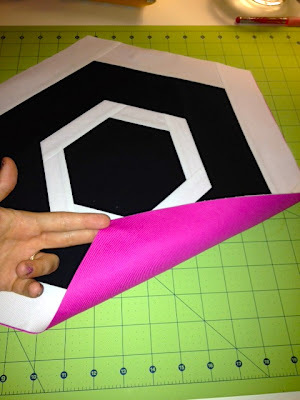 Use your pieced hexagon to cut another hexagon from your lining fabric so they will be the exact same size. Take a deep breath and cut your pieced hexagon and lining hexagon in half as shown in the above picture. It's important you cut through the points, not through one of the sides! Now it's just like any other zippered pouch. I have a more elaborate tutorial for these here. 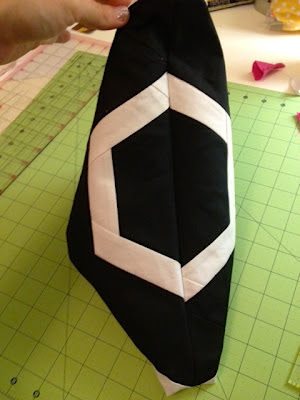 Place lining fabric right side up, put a 9" zipper right side up on top of the lining, and then place your pieced half hexagon right side down. Pin the dickens out of it and sew 1/4" from edge. Repeat for the other side: Lining right side up, zipper right side up, exterior right side down! 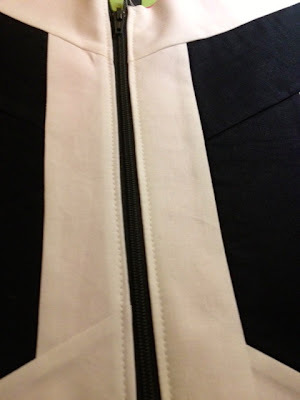 Press exterior and lining fabric away from zipper then top stitch on either side for a nice finished look and to keep the fabric from getting caught in the zipper. OPEN UP YOUR ZIPPER!!! Pin exterior pieces right sides together. Pin lining pieces right sides together. 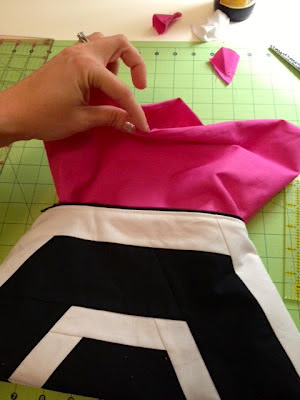 Fold the zipper toward the lining before pinning. 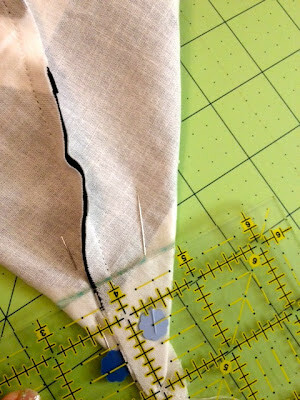 Sew around all sides using 1/4" to 3/8" seam allowance leaving a 3" hold at the bottom of your lining for turning. 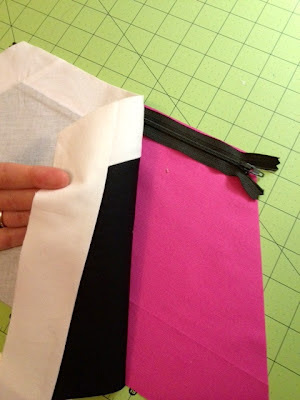 Since the sides are 9.5" and you're using a 9" zipper (it's actually 10" with the tape), you will want to sew close to the zipper stops, but not past them or through them in order to get the best looking zipper ends. This is where the boxy part comes in. This method "boxes" the corners. 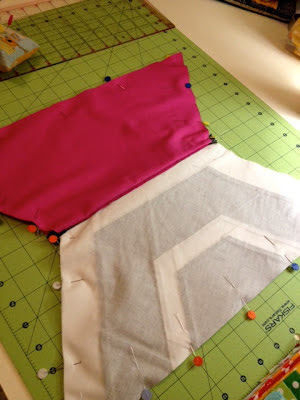 Pin all four corners together, matching the seams along the bottom and sides. It helps to push the seam allowances in opposite directions and nest them. 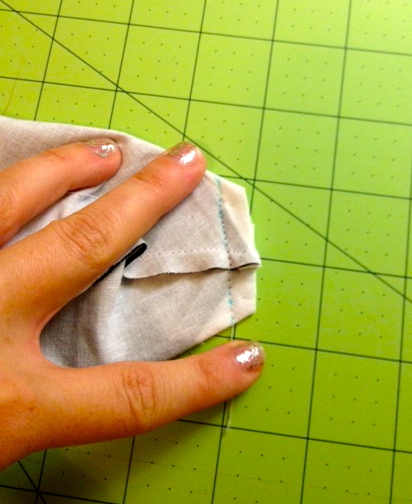 Measure 1.5"to 2" (it's up to you, either is fine) down from the point and draw a line. Sew along these 4 lines. Cut the corners off leaving 1/4" of fabric from the line you sewed. Turn the pouch right side out through the hole in the lining. 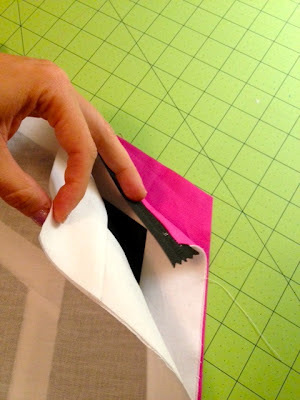 Use a turning tool if necessary to push out the edges near the zipper and the corners. Ta-da! A cool shaped zipper pouch! If you decide to make one I'd love to see it!!! What a great idea for a beautiful little pouch!! that's awesome Kelly! And very original! Cute, cute, cute! I love black, white and bright pink. 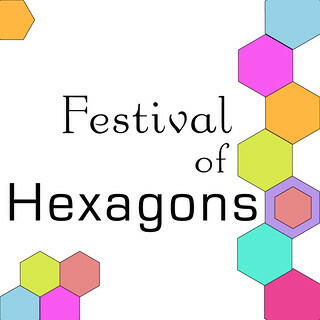 Also a great way to learn this method of hexagons. Thank you! This is pretty much fabulous! I love this idea! This is super cool, Kelly, and I'm TOTALLY digging the colors. I like the big hexagon as a block too! SO clever! It looks terrific! What a very beautiful idea!!! This turned out so great. 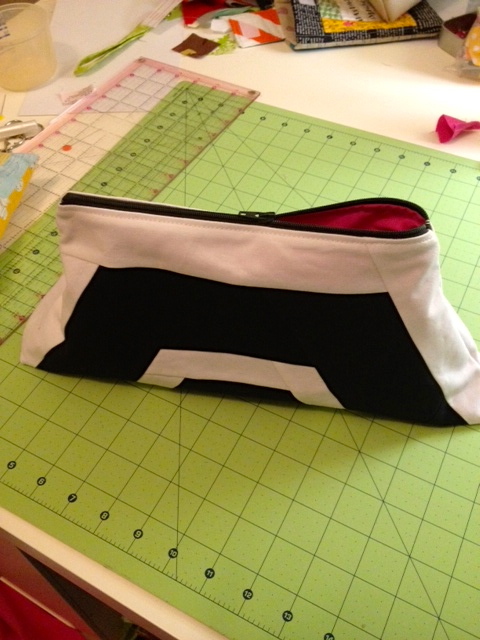 I love home-made purses and pouches. Great job on your hexis! 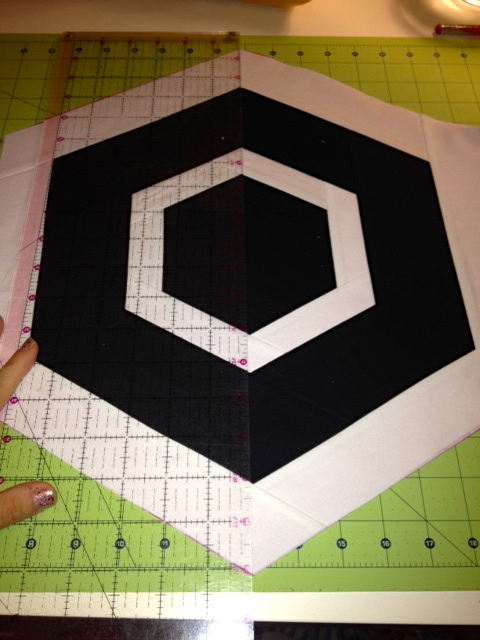 How do you get a hexie without a hexagon ruler?? My Precious QAL August Link Up & Giveaway!